Nudibranchs are marine creatures belonging to the suborder Opisthobranchia in the phylum Mollusca. Nudibranchs are often called “sea slugs” and the two terms are sometimes used interchangeably, but it is not true that all sea slugs belong to the suborder Opisthobranchia. It is only the naked-gilled sea slugs that are Nudibranchs, while the word sea slug can be used for a wide range of other shell-less gastropods. All the shell-less gastropod species are in turn found in the same class as the shelled gastropods – the Molluscan class named Gastropoda. 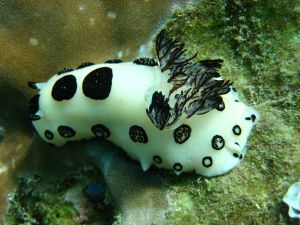 Nudibranchs are sometimes kept in reef aquariums, but are often short lived since the aquarists do not fully understand how to care for these creatures. Nudibranchs are sometimes marketed as superb algae eaters, but this is false information since all known Nudibranch species are carnivorous. Always research your particular Nudibranch species to find out what type of diet it needs. Some Nudibranch species feed on Bryozoans, some need Hydroids in the aquarium, some eat sponges and some eat Tunicates and Barnacles. A few Nudibranch species are cannibals and will eat each other. Bryozoans are petit marine animals that create stony skeletons of calcium carbonate, which make them look similar to corals. Bryozoans are commonly known as sea mats or moss animals. Hydroids belong to the same phylum as corals, sea anemones and jellyfish. Tunicates are saclike filter feeders belonging to the subphylum Urochordata. They are equipped with input and output siphons, and are commonly known as sea squirts. Barnacles are distant relatives of lobsters and crabs, and are usually found attached to stones or man-made structures such as ships. The size and shape of Nudibranchs vary. The largest Nudibranch species can grow up to 60 centimeters, while smallest are no larger than 4 millimeters. Nudibranchs have a jelly-like body and lack mantle cavity. An adult Nudibranch is always without any type of shell or operculum. On the head of the Nudibranch you will find sensitive tentacles that can register tough, smell and taste. Club-shaped organs named rhinophores are responsible for detecting smell. As mentioned above, the Nudibranch has naked gills. The Nudibranch breathes via bushy extremities that are found on the back of the body, a so called branchial plume. You will find Nudibranch species all over the world and in shallow water as well as far down. Warm and shallow waters will however typically contain the largest variety of Nudibranch species. Nudibranchs are hermaphodritic, but are unable to fertilize themselves. If you manage to provide your Nudibranch with a proper environment and suitable food, it can be a very beautiful addition to your reef aquarium since some Nudibranch species are among the most colorful species in the ocean. Since the Nudibranch have no shell to protect it with, it has instead developed colors and patterns that provide good camouflage. Strong colors and intricate patterns can also be used to tell predators that a Nudibranch is toxic. Nudibranchs that eat hydroids will often take up sting cells from the hydroids and store them in the dorsal body wall. The sting cells can then be used to ward off predatory attacks. The term Nudibranch is derived from the New Latin word Nudibranchia. “Nudus” means naked n Latin, while “branchia” means gills in Greek. The name Nudibranch can thus be translated into “naked gills”.